As a lifelong horse lover, I’m sickened and disgusted by horse slaughter. American horses are not raised as meat animals. They’re companion animals and serve humans in a variety of ways. Just think about how man’s association with the horse has benefitted humans. They’ve plowed our fields, carried us on long journeys, transported our goods, and provided recreation. To me, killing an equine for horse meat is the same as killing a canine for dog meat. I’m not alone here. Four out of five Americans oppose horse slaughter, yet it continues in North America. More than 100,000 American horses are slaughtered every year for horse meat. If you’re pro horse slaughter, don’t bother reading the rest of this article. If you’re undecided, the following horse slaughter facts might help you make an educated decision. If you oppose horse slaughter, this article will provide you with ways to help end horse slaughter of American equines. One of my granddaughters. 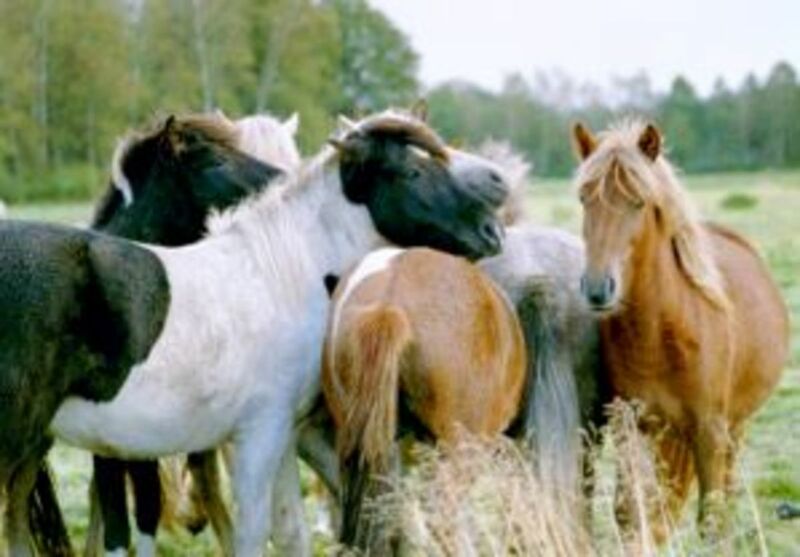 Ponies, donkeys, and all horse breeds could end up as horse meat. Horse slaughter in the U.S.
Up until 2007, horse slaughter in the United States was legal, and there were three horse slaughter houses. Two were in Texas, and one was in Illinois. All three kill plants were owned by citizens of Belgium, and almost all the meat went to Belgium, France, and Japan. Horse meat in these countries is considered a delicacy, and it’s as expensive as veal. Pressure and outrage from U.S. citizens forced American horse slaughterhouses to close. Residents living near the kill houses were especially vocal. They would often find mutilated foals in ditches, and the smell coming from the plants was terrible. I don't understand how anyone could enjoy eating horse meat! I’m a meat eater. I enjoy beef, chicken, pork, and fish. I don’t eat veal because of the way veal animals are treated. I have three major problems with killing horses for horse meat. One is the way in which they’re killed. Some kill plants use a captive bolt gun, which is the same way most cows and pigs are killed in slaughterhouses. The blow is supposed to render the animal completely unconscious. The problem here is that a horse’s brain isn’t positioned the way a cow’s or pig’s brain is, so it’s difficult to render a horse unconscious. 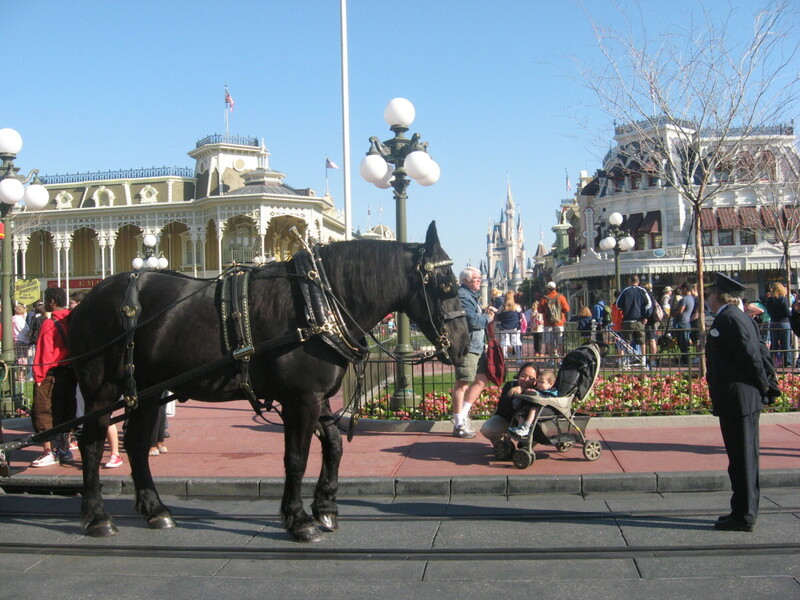 Many horses have to endure being hoisted up by a chain attached to a hind leg and having their throats cut, while being completely aware of what’s happening. In many horse slaughterhouses in Mexico, the horses are hacked into with a knife first. The idea is to saw through the spinal cord in order to make the animals immobile. In some Canadian slaughterhouses, the horses intended for slaughter are shot with a rifle, which in my opinion, is much more humane than the other methods mentioned. In most kill houses, foals under the age of six months and still nursing are left to starve to death once its dam has been killed. The second problem I have with horse slaughter is the suffering the animals have to endure just to get to the slaughterhouse. They’re usually crammed onto big trailers, and they might have to go days without any food or any water. Mares have been known to give birth on these crowded trailers. Can you imagine the horror of that? Because there are no kill plants in the U.S., horses meant for slaughter might have to travel hundreds of miles – maybe more – in these horrendous conditions. 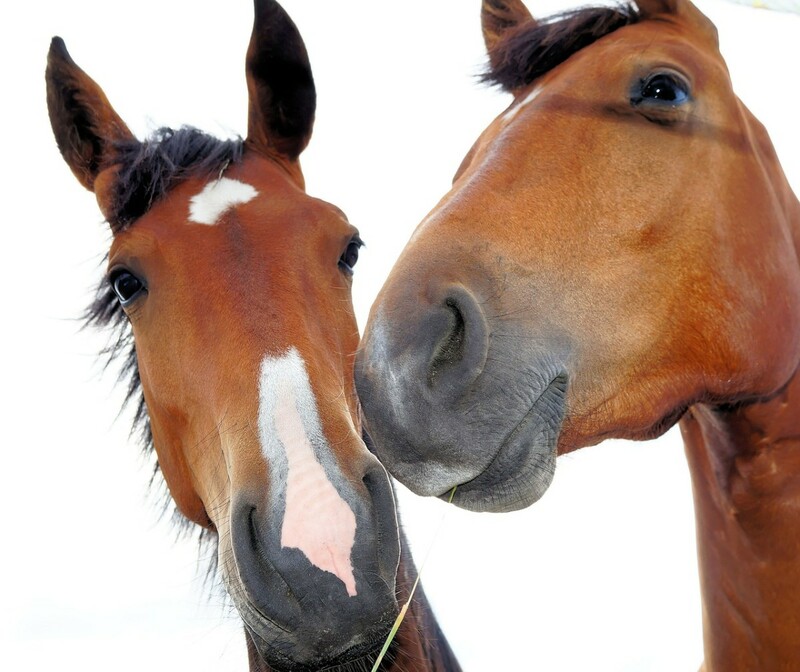 Thirdly, I oppose horse slaughter because horses are companion animals – not meat animals. I feel the same way about killing a horse for horse meat as I’d feel about killing a dog or cat for meat. I’ve owned many horses, and I can tell you that they form close bonds with their owners. 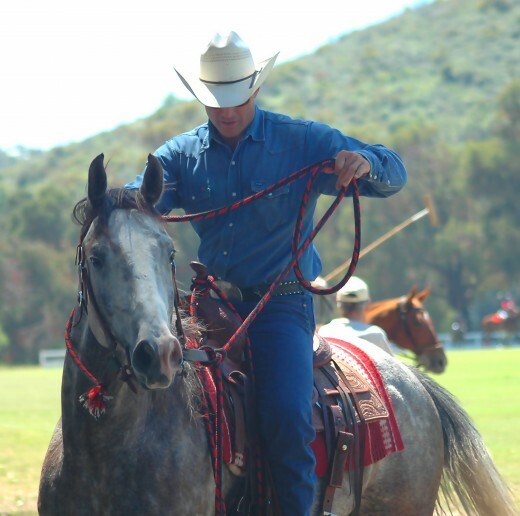 A well trained and properly handled horse or pony is gentle, affectionate, loyal, and trustworthy. I’ve had numerous horses that would follow me around like a dog would. 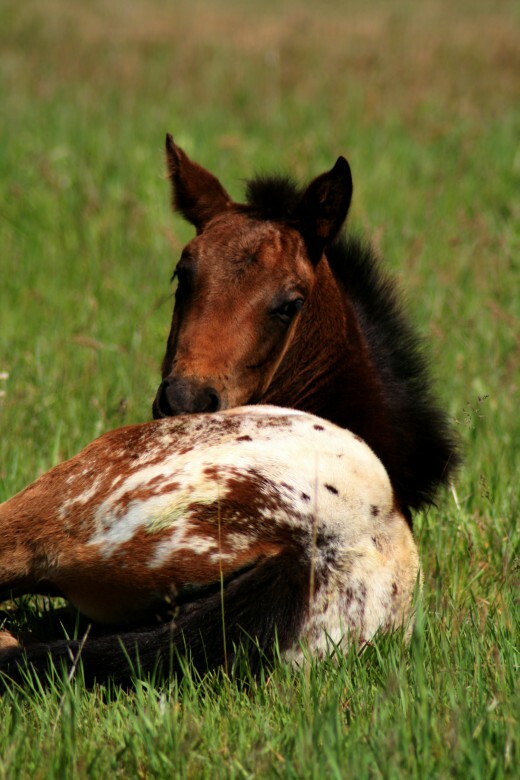 Nursing foals are often left to starve in horse slaughterhouses. Buyers for the horse meat industry travel across the United States purchasing horses for slaughter. Most kill buyers concentrate on horse auctions that are located near the borders of Canada and Mexico. A horse owner can unknowingly sell his horse to a kill buyer. He might think his beloved horse is going to a good home, when in fact, he’s turned it over to be tortured and killed. Unwanted horses are a huge problem now. With the depressed economy and rising grain prices, some owners simply can’t afford to keep their horses. Horse rescues are at capacity all across the U.S., so many owners don’t have the option of turning their equines over to a rescue. These days, it’s difficult to give away a horse, too. Many desperate owners are turning to euthanasia, which is a much more humane option than selling a horse to a kill buyer or allowing the horse to starve to death. Unfortunately, euthanasia and disposing of the carcass isn’t usually cheap, so some horse owners can’t afford it. About the only option left is to kill the horse yourself, with a high-powered rifle. The target should be in the forehead, at the exact center of the square formed between the ears and eyes. If you think this sounds cruel, watch videos of horses being slaughtered in kill plants. You’ll see that a quick shot to the brain is a much more humane way to die, and the animals don’t have to endure shipping atrocities, rough handling, and going without food or water for extended periods of time. Horses serve humans in many ways and deserve a better fate than ending up as horse meat. I’m amazed and appalled at the groups that are pro horse slaughter. They include the American Quarter Horse Association, the American Association of Equine Practitioners, the National Cattlemen’s Beef Association, the Illinois Farm Bureau, the American Veterinary Medical Association, and numerous agricultural associations and organizations. I sort of understand the Cattlemen’s Association’s stand, but I don’t understand how the AQHA and veterinarian groups could be pro horse slaughter. On second thought, I do understand the thinking behind their position. It’s all about money. They’re far more concerned with the horse industry as a whole than they are with the welfare of the individual animals. This old mare made a great kids' horse for my granddaughter and niece..
Help end the slaughter of American horses! There are several things you can do to help stop our horses from turning into horse meat. If you’ve been thinking about getting a horse, consider horse adoption. You can find all types of rescue horses for adoption, including many different horse breeds. Many of the horses for adoption are gentle and well trained. Some are older animals that might be perfect for a child or novice. Use the internet to find a horse rescue near you. If you can’t adopt a horse, you can sponsor one, no matter where you live. Look online for a horse rescue that’s in need of funds (which covers every horse rescue), and agree to send a monthly donation that will help cover grain, hay, and medical expenses. If you don’t want to commit to monthly donations, you can always make a one-time contribution to a horse rescue. An easy way to help is to contact your senators and your representative and let them know how you feel about American horses being transported for horse slaughter. Ask your politicians to support H.R.2966 and S.1176, both of which have bi-partisan support. I did this in 2010, before the mid-term elections. My representative was a Democrat that I had voted for previously. He basically told me that horses were just animals, and people had the right to do what they wanted to with their own animals. I didn’t vote for him in 2010, and I encouraged others not to vote for him. Thankfully, he lost his bid for re-election. If you’ll go to the Humane Society of the United States, contacting your senators and representative is super easy! The site can also help those outside the U.S. give their opinion, via a link. 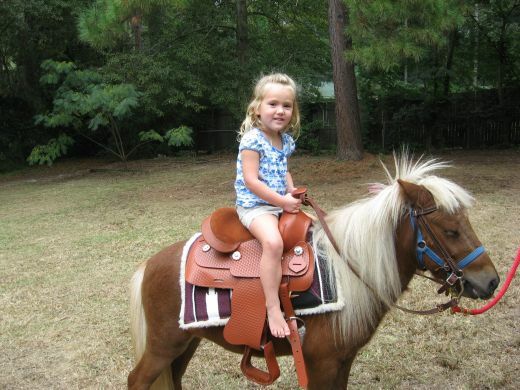 Helpful tips for choosing a horse or pony for a child. Several horse breeds are discussed. Videos included! Information about building horse stalls, with size requirements for different horse breeds. Great ideas for horse toys, along with why horse toys are important. Watch the video of a horse playing with a horse toy! How to make your own first-aid kit for horses - what horse supplies to include and why you need them. 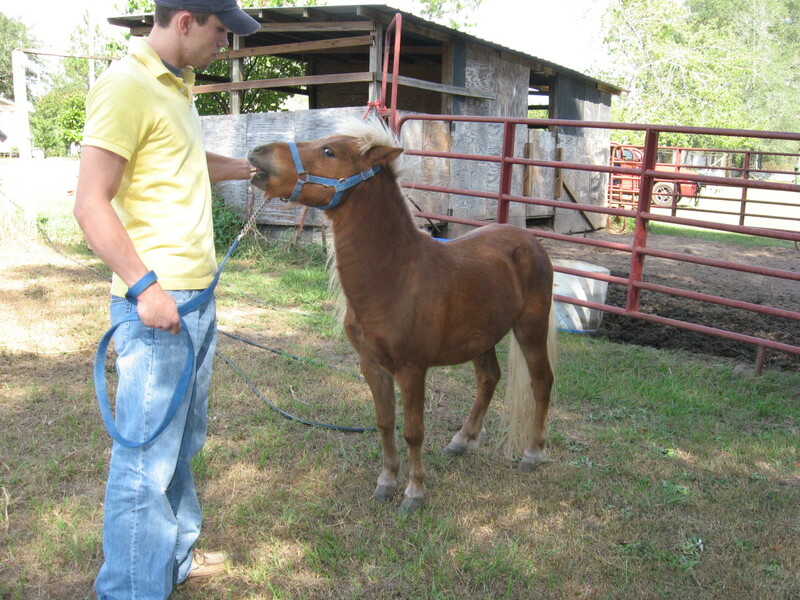 This article discusses the problem of unwanted horses, along with possible options. Missy, I agree that there are too many horses being bred, especially those of inferior quality. That's great, Rhianna. I don't think horse slaughter will stop until horse owners have some good options for re-homing animals they can no longer care for, though. Thanks for reading! I'm trying to raise money to stop horse slaughter :) Hopefully it will stop! Well you're right about that:) I will do my research and write it when I can. MissJamie, write your article! There can never be too much info on animal welfare. Oh, I'm glad you wrote one about veal. I won't need to then. I'm definitely ashamed to be a member of the human race most days. Most humans don't act like humans anymore. MissJamie, check out my article on veal. Ugh. Sometimes I'm ashamed to be a member of the human race. That's so sad, northwest. Hopefully, someone will come up with some viable solutions. I completely agree. In the area in which I reside, there isn't even any place to report abuse or rescues nearby and there are a lot of horses around. northwest, I think you have some valid points, but I still think the handling and killing could be done much more humanely. I know how much it costs to keep a horse, as I've owned around 50 over the years. I understand that some owners simply can't afford to maintain their animals any longer, and they have few options. Like you, I'd take them all if I could - along with all the unwanted dogs and cats. I don't know what the answer is, but I wish we could find one. Obviously not a fun idea to be inhumane when disposing of any creature. However many of the horse owners who send their animals to slaughter have no other choice or options and it's a shame there aren't more rescue groups out there. Perfectly healthy animals go to the slaughter all the time. I would also interject that the only humane way to kill any critter is by euthanizing them and that's not the best idea to do to any critter that's going to meat. Severing the spinal cord with the knife numbs the horse and calms them, allowing them to bleed out relatively painlessly. Bullets also have a hard time finding that horsey brain of theirs not to mention being a high risk job for the "executioners." The hoisting them up is so they bleed out as quickly as possible to reduce suffering time. Indeed, I would pose that most people have trouble with the idea of horse meat and killing such "noble" and "lovely" animals. I'd say that the systems in place aren't perfect, but there's no fat, greasy man sitting behind a big desk somewhere rolling his moustache in his stubby fingers and dreaming up the best way to torture the ponies as they die. The methods being used are effective because they're inexpensive and relatively quick. 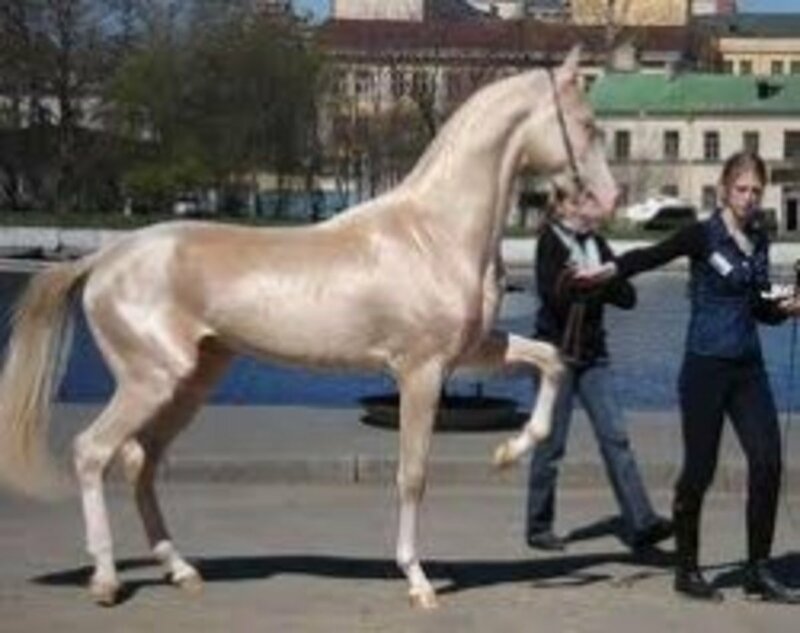 I would wager that no horse takes more than a minute or so to gurgle out its last blood-foamed breath. Complain about this issue all we like, on average the annual care of just one horse is $1200-$3000. I'd take them all if I could (I had 4 rescue horses myself) but financially it wasn't working. It took me 3 years to find them all homes and they were free! Banning slaughter will create issues that will need answers and we shouldn't do it until we are prepared to deal with them. You can ignore this comment but I think it's a valid argument. The problem can't be fixed until a better solution is found. Rosie, thanks for your kind words and support. It's a shame that humans aren't more humane. Gypsum, I feel the same way. I wouldn't hate horse slaughter so much if the animals were handled more compassionately and killed as quickly and as painlessly as possible. Thanks for reading! Excellent article, couldn't stop reading. Although the whole thing makes me sick and disappointed with humanity, I'm glad there are voices like yours who strive to make a difference. Thanks, habee, for an informative but sad read. I have ridden horses for over 30 years and am heartbroken to hear that such atrocities are going on in developed countries. 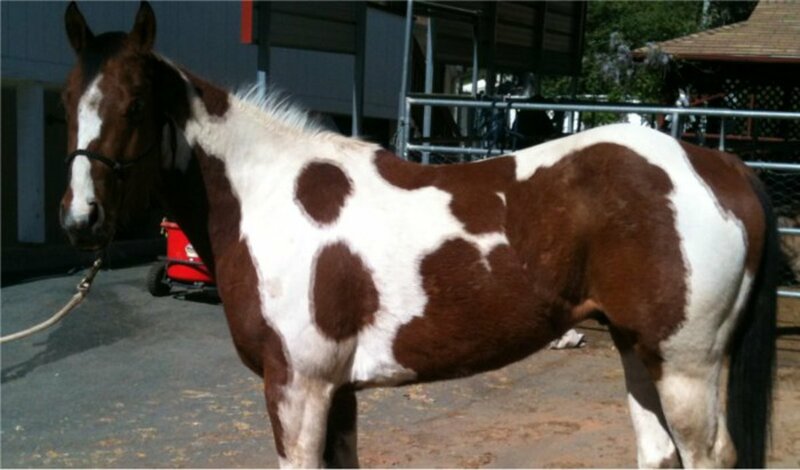 I see horses like I see dogs...as companions, friends, therapists...their services to humans are invaluable. I, too, like many, avoided the videos to prevent tears. Thanks for helping make others aware! Well said habee. As a horse lover myself I feel the same way. Say what you will, the words 'humane' and 'slaughter' do not go together. There is no such thing as 'humane slaughter'. If slaughter were humane, it wouldn't be slaughter. There are a couple of wonderful ladies that have been given permission by a slaughter house located near Ottawa, Canada to find homes for as many healthy, sound, sane horses as they can. Since they can not save them all, they pick through and find the ones that appear the most healthy, sane and adoptable. They have set up a Facebook page to help find homes. These horses often have just days to find a home before being shipped off to the kill facility. If you can't offer a home to one of the horses, you can donate to a fund set up for loans to people trying to adopt them. These horses are not free. The price is set by the feedlot and is not negotiable. Shipping is also your responsibility. Please visit their Facebook page, Like and Share it with your friends. The more people know about this, the better the chance another horse can be saved. Also, keep in mind that the Facebook page is not the place to post a rant. 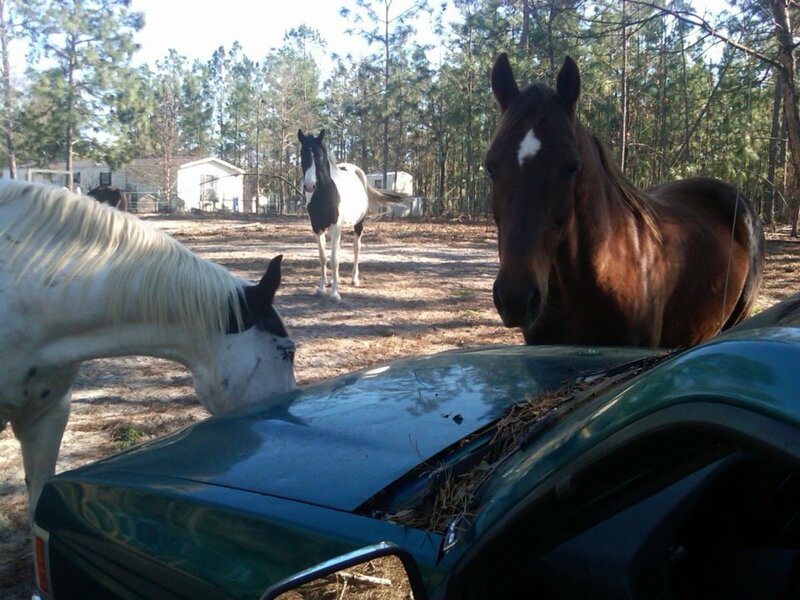 It is meant only for people to inquire about helping one of these horses. This is so sad, I can't believe people would treat horses in this way! Hi I know there are many people that want to stop horse slaughter. I want to! I am 12 and I am smart enough to know that this is wrong in science class are teacher said deer deserve to die because they are over populated...well i resopnded back well the human population is way over populated and I don't see us being hunted. Why are horses being sent off to be slaughter. People are out of there minds I come from a family of five kids and my many years of my life I have watched the world fall apart and I think what happens if when or if I have kids that I can't show them the animals and horses I grew up with and the human race is alone left with some animals but alone with nothing.. And finally they the human race will wonder what they did wrong why these creatures we use to have went extinct and they have screwed everyone over the people who wanted the animals to live. I may sound stupid but I am only twelve and people who are so cruel that kill these animals/creatures I hope burn in hell because god created theses animals and man should not take away gods creatures. ( sorry if I have disrespected anyone religion) horses help man with so much! But still man takes away what they think is bad or a food that is amazing. I can t eat deer pork fish lamb HORSE crab or anything that once was living. Some people I can't even loo k at for killing these horses or hunting deer when I was five I use to put signs on hunters cars and tell them that hunting was wrong but the would laugh and say it was a sport! I wish that this world would change back to when there was no cars just horses as traceportation and walking and man was still independent and not so over populated!!!!!!!!! Just tell me why I am 12 and I have to think and worry about this when I really can't do anything to help! This hub was really interesting and informative, thanks for writing it! My father owns a livestock buisness, and the hogs get a less painful death than horses do. If Mexico and Canada are going to kill horses for meat, why cant they do it less painfully, like they do to cattle and dogs, by putting them in a gas chamber? I'm looking forward to getting my own horse soon, and I love riding my relative's Shetland! hopefully horse slaughter will end! very nice! Thanks for the info . Lexi, that's awesome! I'm glad another equine was saved from horse slaughter. Now Chuckles is living a useful, happy life instead of being served as horse meat. Congrats on getting your first horse! tk, unfortunately, I sort of have to agree with you. I wrote a more recent article discussing the same points you brought up. You can find the link to that article in one of the above comments. I hate killing equines for horse meat, but if it's going to be done, I think it should be done in US plants where there are at least some regulations in place. I remember when the ban first went into affect, I was so happy. But after the last five years, the horse market has bottomed out. You can go to a horse sale today and buy a nice, young horse for $5!! People can't afford to own them. Most times they can't even give them away for free! I have see horses starving in pastures, left to die. I have also seen where people who can afford to keep them turn them loose! And don't get me wrong, I deeply love horses, I have nine of my own. Three that were given to me my people who couldn't care for them. I am for the slaughter of horses. Many don't know, but just because horses aren't being slaughtered in the US doesn't mean that they're not being slaughtered. They are packed into double decker trailers and force to ride for hours maybe even days with their head hung low until they get to Canada or Mexico. And if they are still alive by the time they get there, they suffer a curel and inhumane death in a forgein slaughter houses. I would much rather have slaughtering houses in the US where at least the USDA can moniter them. Horses are going to be slaughtered either way, whether its slowly and they suffer or they are sent to the slaughter house. Banning it in the US isn't going to stop it. That's great to hear! I found a local slaughterhouse that uses the humane kill method. They don't kill horses, though. But horses are a different matter. I dont know about there, but in England they do have stress free slaughter houses for farm animals. I actually went to one and watched the whole process...............wasn't sick, didn't faint, and it was stress free for the animals and even the workers there. Clairemy, kudos to you for your stand against animal cruelty. I agree about the shooting, but I still think it's more humane than some slaughterhouses. I too not only love horses, but have rescued, competed and taught them. I am a meat eater, but agree completley that horses are companion or work animals, not for meat. For me the kindest way to euthanise them is lethal injection. I have held horses that have been shot , not an experience i would recommend anyone to go through. Hi, Blake. It's never too young to be concerned with animal welfare. Good for you! I really hate this and i'm only 13. Flickr, I really appreciate your feedback and thought on horse slaughter and horse meat. It's a highly charged issue, for sure. Very educational and insightful. I am neutral when it comes to eating animals, I believe food is food, but I consider myself a vegetarian/vegan just out of preference. Although I find it immoral and wrong to be 'inhuman' towards any animals especially towards horses, I feel that they're more majestic then most animals. Just thinking about horses being slaughter makes me want to cry but I do feel that they are a food source but I disagree with certain tactics and ways that they are treated and put to death prior to being eaten. Wonderful article. Ruthanne, thanks for your thoughtful comments. I agree that we should treat all livestock better. The equine associations want slaughter so it will drive up the market price of those they breed. In this economy you can't give a good horse away. Unfortunately back yard breeders are a great contributer to the issue (no different from dogs and cats - think of the millions euthanized every year). Slaughter is necessary due to the ignorance and greed of those who continue to breed in excess. I think we are in agreement here on the main issues, and you're right, backyard breeders aren't helping anyone. I didn't catch the direction you were meaning for it to go though. To me, it felt rather biased towards your opinion on the matter, and while you are free to feel any way you please, and to share with your many readers; I felt that you should have included points and facts from both sides in order to be true to your title, which is why I was bothered. So many in the general public are so vastly uninformed about any and all aspects of the horse industry, and it upsets me when these people form opinions based on sensationalized articles and news stories instead of seeking out the facts for themselves. The last thing the horse industry needs is people who have never touched a horse, having a say in making the big decisions about what is best for America's horses and the people who own them, based on one-sided articles that claim to be the whole truth. (This is not meant to single out your hub by any means, I'm referring other articles I've read in the past. Namely one written by an animal rights lawyer that exclaimed something along the lines of, "Obama wants Americans to eat horse meat!") I want the industry to make a successful comeback, and I don't think I'm alone on that one. Shelby, I somewhat agree with you. If you'll read the above comments I made, you'll see where I said that forcing US kill houses to close down probably wasn't a good idea. At least they were regulated better than the Mexican plants. I know unwanted horses are a huge problem. People are often trying to give me a horse or two. I honestly don't know what the best answer is. I wrote a hub about that, too. Personally, I could never have a horse butchered after it had served me faithfully. It would be like having my dogs killed for meat. I realize, however, that not all horse owners form the close bonds with their horses that I did with mine. If there were a quicker, less painful way to kill equines, though, I don't think so many Americans would be against horse slaughter. I also wish people were more selective in breeding. We bred horses on a small scale, but we bred only the best mares to our champion stud. We knew we had a market for our foals. If you read my hub about unwanted horses, you'll see that I cover just about every angle. This hub was meant to be more focused on Mexican kill plants. I'm not sure any horse people out there are for the inhumane slaughter of horses, to be honest. And while money is part of it, it's not the only reason or even the biggest reason people in the horse industry are behind it. Closing the U.S. slaughter houses did not end the slaughter of America's unwanted horses, and it was not the correct "solution." Instead, these unwanted horses were dumped off on highways, left to starve or die of disease, or shipped out of the country to slaughter instead, where the U.S. has absolutely no regulation at all. Not to mention it drove the horse market straight into the ground which only exacerbated the problem of people not being able to afford to keep their horses. In my eyes, I guess I see horse slaughter houses in the U.S. as the lesser of two evils and stricter regulation on all aspects of the process is key. I would have liked to see all sides of the story in this hub. Shelby, I've owned about 50 horses over the years, and I've also trained horses for others. 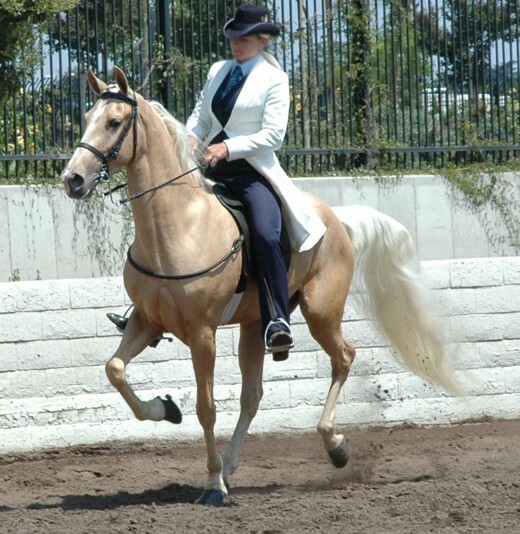 My quarter horses and Appies were used for pleasure, trail, timed events, reining, halter, and cutting. There's absolutely no reason for a horse to be killed inhumanely. It just boggles my mind to think that any "horseman" would think it was okay to kill a horse by hacking through the back of its neck with a knife - not to mention the horrors of shipping. Have you ever been in a slaughterhouse and witnessed the killing, firsthand? I have. American horse associations are for horse slaughter for one simple reason - money. It makes the overall value of horses go up. Habee, have you ever owned a horse? I think you need to do some more digging on this topic, horse slaughter is a necessary evil in the U.S. and there are perfectly sound reasons why American horse associations are behind it. Sherri, I loved the video! We need more groups like Turning for Home! Thanks, Adrienne. Killing horses for horse meat is brutal in some slaughterhouses. Thanks for caring! Oh Habee, you got to be kidding me, I cant believe horse slaughtering is something that actually is real. Thats the most horriying thing I have read. I could not watch the video. Voted up! KT, I understand your point. I think most of us who wanted horse slaughter in the US to end didn't have the foresight to see that we were just making things worse for the horses. Like you say, at least kill houses in the US were regulated. I know unwanted horses are a big problem, and I don't know what the best solution might be. Under the section 'Why horse slaughter is cruel,' the second paragraph states how horses are slaughtered in MEXICO and CANADA. I understend that horse slaughter in not the most desirable choice in the U.S., but because of the shutdown horses are just being shipped to MEXICO and CANADA. You saw how the horses are killed there. At least in the states, all three kill houses were USDA regulated. I work for a horse sale operation in Billings, MT and due to the shut down, horses are literally bringing nothing. We find abandoned, sick horses in our back corrals because people can't keep them or sell them. Some customers have found horses abandoned in their horse trailers when they leave. The fact is horse slaughter is not the problem. The amount of unwanted horses is. Thanks, Sherri! I can't wait to watch the video!! The video will bring tears not of sadness but of joy at the enormous positive energy that can arise and be put to use when people and horses come together to benefit life. Instead of becoming horse meat, El Frio is now a therapy horse who will be giving to others for many, many years to come. Kayley, if you're in the US, please contact your congressman and senators and tell them how you feel about horse slaughter. Maybe if enough horse lovers make their voices heard, we can put a stop to sending our beautiful animals to Mexico and Canada to be brutalized. Hello. I am completely against horse slaughter. I couldn't imagine a horse being killed like that. Ive also dont a LOT of research on it too and horses are sometimes improperly shocked and crushed to death. So did we, Mary. I honestly believe that a quick bullet to the brain is more humane than allowing a horse to starve to death, or than subjecting it to the horrors that most kill houses are. I knew I'd get upset when I read this, habee. I didn't watch the videos, I just couldn't. I don't know what the solution is for all the horses that people can no longer afford to keep. I'd hope they could be adopted by someone who can take care of them. 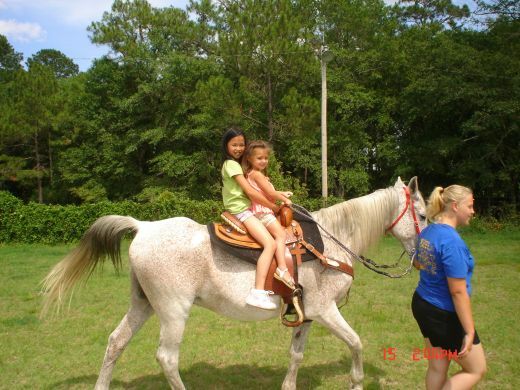 Horses were a vital part of my childhood, and my children's childhood. We always had a friend in our horse. HH, I was hoping you'd stop by to read this, as I know you're a fellow horse lover. I can't imagine eating horse meat. To me, it would be like eating a dog or cat. I couldn't watch those videos. I love horses and can't understand that people would want to eat them. However, they will not change their minds but the result is that they get killed in Mexico or such countries who no calms about them how thye do it. That is the only danger in forbidding it. Here, in Europe, they export them all the way to Italy cramped into loffies and without food or water because the Italians demand them to be killed in their country. Nobody does a thing about it to stop it. Thanks, Hillbilly! Give your horses a hug from me! Ms. habee, as I write this, my quarter horse filly is trying to get my attention through the living room window (the electric fence is down...again...and she and her mom and the gelding are in the yard...again). I knew the slaughterhouses had been shut down, but had no idea how widespread this atrocity is. I may not have agreed with you completely on the deer hunting thing, but totally support every Hub of yours I've read since. Keep up the good work, and thank you for being an advocate of our equine equals. I really didn't know that the USA killed horses for meat. I'm really shocked. I couldn't bring myself to watch the videos - I'm sure you understand why. Do you happen to know if this happens in Britain? Thanks for highlighting such an important and disgusting issue. Dora, thanks so much for reading about horse slaughter. Your comment is appreciated! Great hub! Thanks for sharing and for caring about the animals. I love horses too, though I never owned one. Moon, they were tough for me to watch, too. Thanks for reading and for caring about horse slaughter. I couldn't watch your videos. How sad. Great hub.